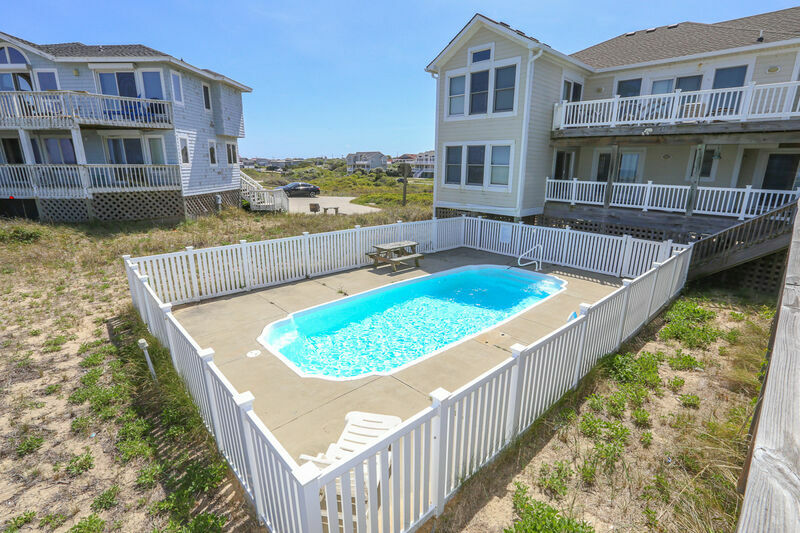 Relax and enjoy the beautiful, panoramic ocean views from this oceanfront home located in Southern Shores, approximately a half of a mile from Croatan Highway (bypass road); easy in-and-out access. This wonderful home offers everything you and your family could hope for in a vacation destination. 4 master bedrooms (1 with King and CATV, 1 with Queen and CATV, 2 with Pyramid bunks with CATV). Laundry room; recreation room with CATV, DVD player, pub table, wet bar with refrigerator and icemaker. Large great room with vaulted ceilings, equipped with CATV, DVD player, stereo, surround sound; separate dining area seats 14; spacious well-equipped kitchen. 2 master bedrooms (each with King and CATV).